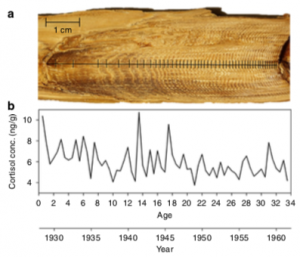 A fascinating new study sheds light on changing stress levels in baleen whales over the course of the past 150 years. Earwax from fin, humpback, and blue whales accumulates over their lifetimes, a bit like tree rings, and the researchers were able to track cortisol levels by sampling the layers in earwax plugs from museum collections. This study averaged the results from 20 whales; the researchers are now beginning their analysis of over a hundred new samples. 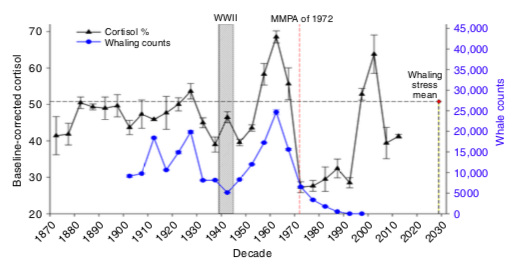 The takeaway is pretty striking: stress levels track well with increasing whaling activity through the early and mid 20th century (blue line below), and dropped dramatically when commercial whaling ended. In the midst of that span, a lull in whaling was countered by military actions durring WWII, which seems associated with a smaller spike in stress. And while stress remained low from the 70s through the 90s, it appears to be rising again in the past couple of decades; the researchers suggest that rising sea temperatures are the most closely associated factor in this recent spike, with other anthropogenic factors including shipping noise also likely contributing. A couple of caveats are in order. Most importantly, this study had only 6 earwax samples that extended past the year 2000, so recent trends may be distorted by the small sample size; the spike in 1995-2000 represents just four whales, and the final plot points include two fin whales that lived only a couple of years (interestingly, their stress loads were low, so the recent dip may be particularly uncertain). All this is really quite exciting, though. We can look forward to much more robust results as this sort of analysis is expanded to more whales, and to other hormonal markers. It’s also possible that as samples from whales that died more recently are included, regional trends related to increased shipping noise may begin to become apparent. At the same time, this is a good reminder that as much as we like to focus on acoustic factors, the stressors affecting modern whale populations are many, with climate and prey availability being especially pronounced. 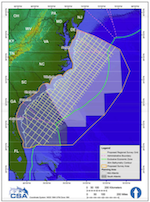 NOAA has issued Incidental Harassment Authorizations to five oil and gas exploration companies, each of which plans to engage in several weeks to several months worth of surveys off the US Atlantic coast during the one-year permit period, which extends through 2019. 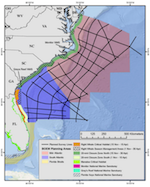 When the Trump administration initially announced its rollback of the Obama-era decision to forego new exploration, it seemed that the lack of Atlantic leasing opportunities in the 2017-2022 National Outer Continental Shelf Oil and Gas Leasing Program would undermine the economic incentives to invest in new surveys (and AEI wrote a detailed “don’t worry too much” post). But the Trump team threw out years of agency staff and scientist work and is now rewriting the OCS leasing program three years early: their new Draft 2019-2024 plan opens up six lease areas in the Atlantic in 2020, 2022, and 2024; new surveys will guide both the government and oil companies as they identify which areas are ripe for development. However, it is inevitable that court challenges from environmental groups and perhaps coastal states will slow the process down or derail it completely. So stay tuned…. 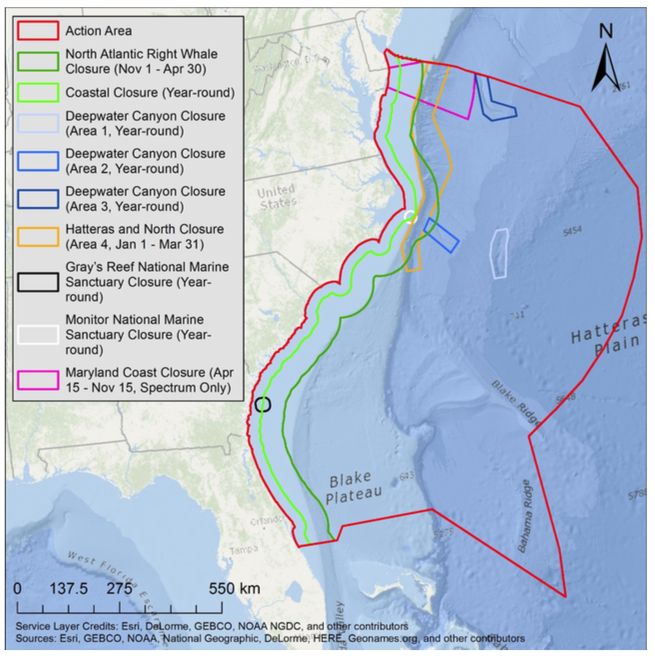 Most of the activity is well offshore, which helps minimize impacts; from November through April they are pushed a full 90km offshore to keep high levels of noise out of North Atlantic Right whale winter breeding and nursing areas; several other smaller areas are off limits either year-round or seasonally. Behavioral impact estimates are surprisingly low (and so perhaps a target of legal challenge): under a dozen right, sei, and blue whales, and a few thousand behavioral changes among far more numerous fin and sperm whales; sea turtles are expected to take the biggest hit, especially in far offshore sargassum habitat, with tens of thousands being disrupted and thousands experiencing temporary hearing reductions. All this region-wide noisemaking, of course, in service of the madness that is continued oil and gas development in the face of a global climate imperative to leave untapped reserves in the ground. The US is already the world leader in oil and gas production and we have thousands of existing leases that have yet to be developed; the last thing we need is more straws in the ground—especially in deep offshore waters. I have to admit, though, that I am no longer as sanguine about the Trumpistas’ offshore crusade as I was when these plans were first floated a year ago. UPDATE, 12/14: For those of you wanting to raise your voice about this, you can count on our compatriots at Ocean Conservation Research to keep you updated on the field of play for public discourse.